Love the colors and the size. I just wish the pile was a little higher, thicker. The rug was exactly what I wanted. Size, color, everything! The only thing that sucked was it was backordered and it took forever to get! About a month and a half! Otherwise price was great and the product was great! Great rug, nice colors, quality made. I LOVE this rug. It's even better in person and is very fancy without the fancy price. It's incredibly soft--so much so that our cats immediately snuggled up on it. We use it in our bathroom to match our gray/blue/purple decor, and it's perfect. We will need to get a non-skid mat underneath since it slides easily on tile, but I expected that. Highly recommend! 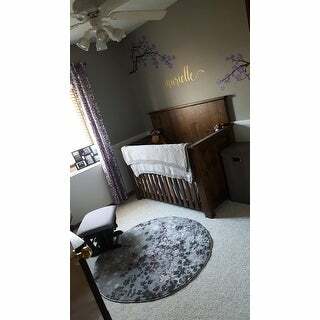 Love this rug goes perfect in my spare room. It’s just what I was looking for, it matches the decor in my spare room. It is a bit slippery will have to purchase a mat to keep it from sliding. really cure, low pile rug. colors are vibrant and true to the pictures online. I wanted to place a small area rug under kitchen table to balance it. This piece worked perfectly under a round table - not too overbearing and colors worked with my palette. Love it, this was another great choice from Overstock.